Num-Num is now available for iPhone/iPad! How do you spell 38? How do you spell out $63.38 on the check you're writing? If you're living in a foreign country, the answer might not be that obvious. Or you might be learning a foreign language. Wouldn't it be nice to have a program that teaches you how to spell numbers? Well, look no further, because you've found one and like the other stuff on this site, it's free, free, free! Any program that can output a string like "centotrentamilatrecentocinquantaquattro" is a friend of mine. If you are learning to count in any of the supported languages this program could be of great help. International visitors: to translate this page, go to http://babelfish.yahoo.com/. hackers/masochists can view the rules, learn this Number Spelling Language and submit rules for other languages. Go to the developer's page for more details. 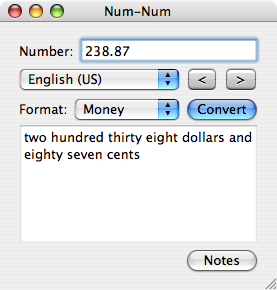 Here is the Java version of Num-Num. (Instructions are here.) You'll need Sun's Java Runtime Environment to see it. This is the real, running program, not a screenshot! If none of these work, consult the developer's page for more options. Type in a number in the upper textbox and press the [Convert] button. Use no thousands separators and always enter fractional numbers with a "." (even though it is really a "," in many other languages). If desired, select another language from the leftmost droplist or select another format from the middle droplist. To go to the next number, choose [>>]. To go to the previous one, choose [<<]. To see the transformation rules, choose [Show Rules]. If you're feeling lucky, you can try messing around with these and viewing the result. If you find yourself messing around a lot, go to the developer's page and see how you can develop, test and submit rules of your own. A cardinal number is a "normal" number (one, two, three), whereas an ordinal number indicates order (first, second, third). A distinct format is needed for years because numbers like 1967 are spoken differently as a cardinal number ("one thousand nine hundred sixty seven") than a year ("nineteen sixty seven"). In addition to the Java version, Num-Num has native executables that run on PalmOS, Windows CE, Windows and Mac OS X.
Download them from here. In all cases, download by first saving the file to a folder on your hard drive, then run the install program (Windows) or unzipping the file (Palm). Num-NumTM Copyright © 2000-2007 by Mohan Embar All Rights Reserved. Num-NumTM is written as a personal project by Mohan Embar. He has made this program available for download on this website under the following terms and conditions. Usage of this program indicates your acceptance of the following license conditions. If you do not agree with these terms, you may not use this program. This program comes with no warranties, either express or implied. In no event will the copyright holder be liable for any damages resulting from the use of this software. This section contains all submitted rules and their authors. Click on the language name to display the rules for this language. Right-click and choose Save Target As... (or Save Link As...) to save this to a file on your machine. Consult your platform-specific instructions for details on how to add this language. If you're interested in creating new rules or fixing these rules, consult the developer's page.